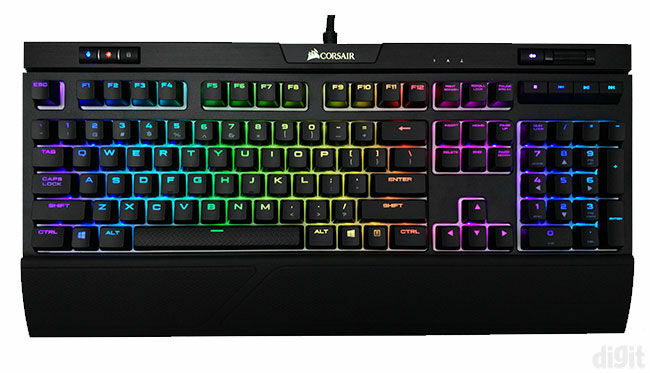 For a premium mechanical keyboard, the Corsair STRAFE RGB MK.2 delivers what is expected. High-end features including full key rollover, macro recording, RGB lighting customisation, multiple profile support, all of these are supported. 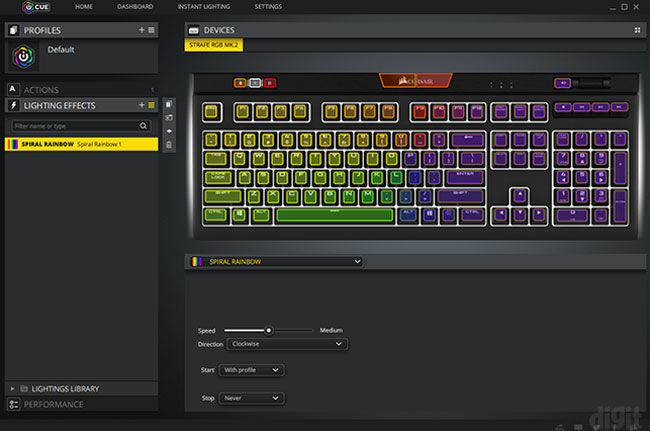 With Corsair’s new iCUE software, playing around with most of these features is fairly easy. Because of the MK.2 design treatment, the STRAFE lineup finally receives dedicated multimedia and volume controls including a volume wheel. You can store macro and lighting profiles on the keyboard using the software that will be retained even after it’s connected to a different system. The wrist rest is still the same flimsy one from the older variant. 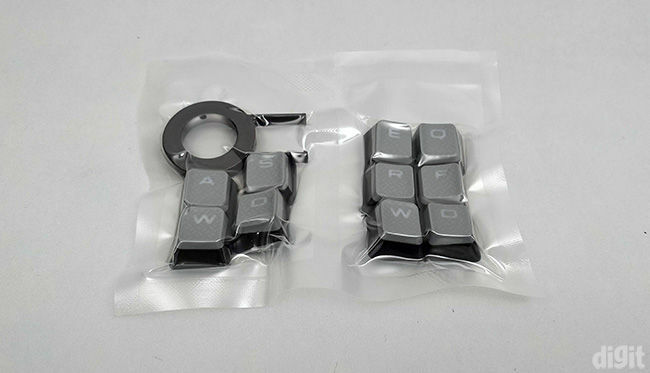 For accessories, you receive a keycap puller, wrist rest and extra replaceable keycaps for FPS and MOBA games. The Corsair STRAFE lineup of keyboards is supposed to be an affordable option for users who can’t opt for the K70 lineup. However, that isn’t the case anymore here in India. Both the new MK.2 versions of the STRAFE RGB and K70 RGB keyboards have the same MRP in India. The differences between the two are minor at this point and you will only notice them upon looking closely. The biggest distinction is the switch options on the STRAFE that is limited to Cherry MX Red and MX Silent. On the other hand, the K70 supports all the Cherry switches. The other differences are present in the chassis design and wrist rest. Considering all these aspects, we would suggest you go for the K70 RGB MK.2 if you’re torn between picking one. You’ll end up getting more in the same price. If you have an invested preference towards the white plate below the switches and the chassis design on the STRAFE RGB MK.2, only then should you consider buying it. Mechanical keyboards are a great investment. Not only do they last you a decade, but they also provide a satisfying typing experience as well. However, they can get really loud depending on the switch type and seem unpleasant for some. To prevent the extra noise, you can either install O-rings over the key switch stems. This is usually a solution for later when you discover that the loud noise is becoming a nuisance for you. However, if you’re planning on buying a mechanical keyboard then you should probably think this through. O-rings will cost a grand or two and then you’d have to manually install them on the switches. In order to completely avoid this extra step, you could go for silent mechanical switches instead. This is where the Cherry MX Silent switches come in. Although this isn’t a new switch, it was initially launched as a Corsair exclusive for a limited time with the Corsair STRAFE RGB. A design overhaul of the STRAFE series of keyboards from the company was long overdue. Along with the K70 RGB, the STRAFE was also given an update with the STRAFE RGB MK.2. In this review, we’ll be exploring the upgrades that the keyboard went through compared to the older model. Almost all the keyboards that we’ve tested so far from Corsair have full N-key rollover implemented. The same has been continued on this keyboard as well. We verified the rollover in Switch Hitter. All the keys that you press simultaneously will be registered by the keyboard. This is quite helpful in games when you need to press additional key combinations to enable a certain function without having to lose control over your primary control. Older variants of the STRAFE series didn’t have dedicated multimedia and volume control buttons. This changes with the MK.2 variant. Not only do you get dedicated buttons for multimedia playback, but you’re also getting a volume wheel as seen on the K70 RGB. It also has a mute button beside it. This is a useful upgrade for this lineup. The top bar of the keyboard is almost the same as the K70 RGB MK.2. The only difference is that the volume wheel has a silver paint job whereas the STRAFE has a black one. You’ll now find a profile switching button as well. Earlier, the STRAFE had dedicated buttons for brightness control and the Windows key lock. 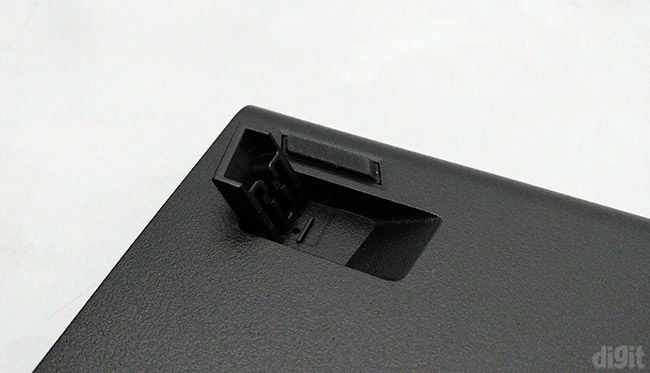 After the Cherry MX Silent switches were launched, the STRAFE supported this new switch along with the regular Cherry MX Reds. Currently, the STRAFE RGB MK.2 supports only two switches as well. Internationally, the two switch variants on the STRAFE RGB MK.2 have a price difference where the Silent variant is priced higher. However, there’s no distinction in the MRP between the two in India. There haven’t been many changes to the bottom of the chassis. 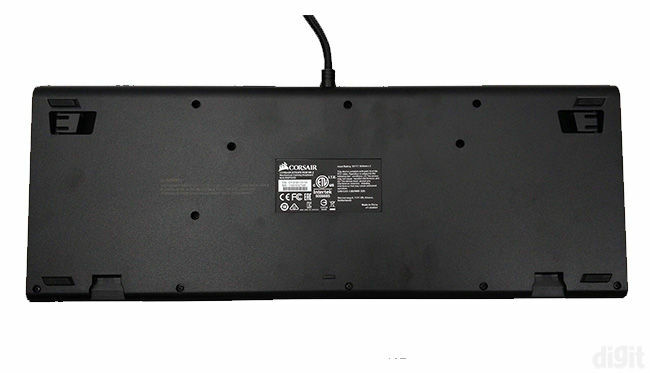 Two extended feet are present at the bottom to give the keyboard some elevation. They don’t have any rubber lining on them and depending on how rigorously you type, the keyboard might slide. 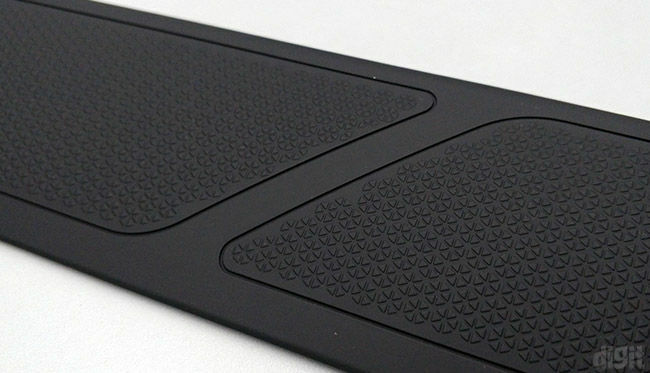 Although there are two rubber pads towards the bottom edge that do offer some friction. While typing, our keyboard didn’t glide at all. Finally coming down to the accessories or box contents, it ships with a keycap puller, extra keycaps, wrist rest and the instruction manual. A plastic keycap puller is certainly a useful tool when you need to clean your keyboard. The extra keycaps have a textured top, so it’s easier to identify those keys without looking at the keyboard. 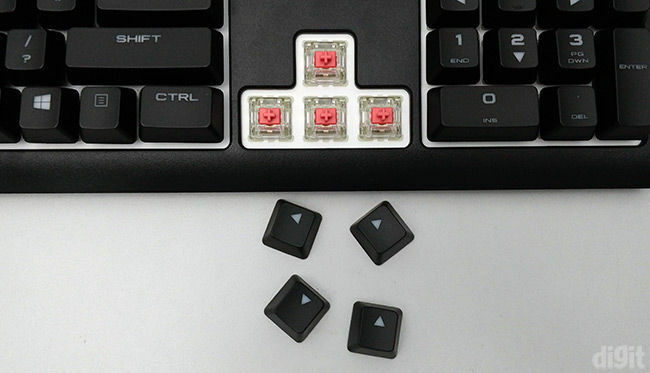 You get two sets of extra keycaps for FPS and MBA games. While several parts of the keyboard were upgraded, the wrist rest didn’t receive an upgrade. 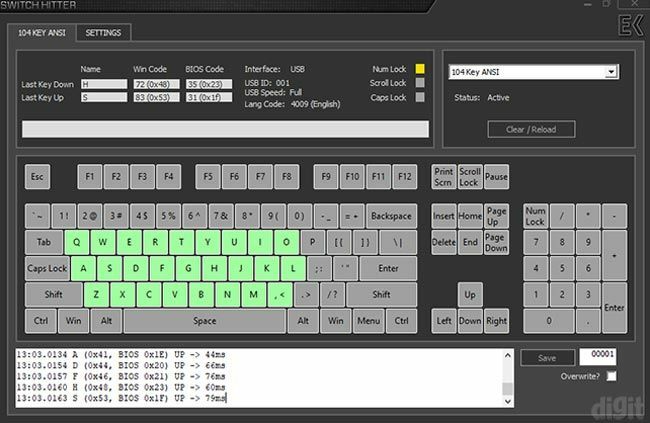 On opening up Corsair’s iCUE keyboard utility software, we found the same set of controls that we saw while reviewing the K70 RGB MK.2. 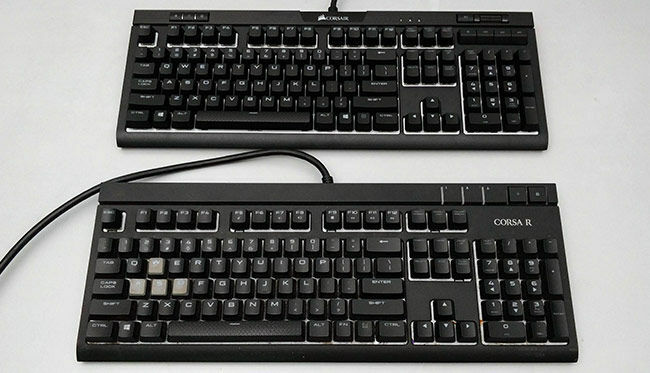 In the software, both the keyboards look the same. All your basic lighting control and macro recording can be customised here. For a better understanding of how the different options work, head over to the iCUE section of our K70 RGB MK.2 review. 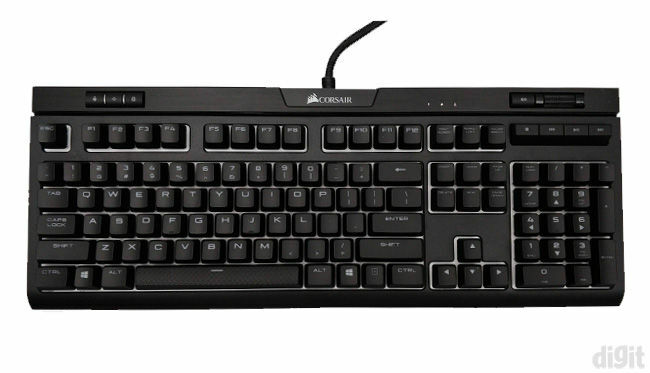 At a glance, the keyboard looks similar to the Corsair K70 RGB MK.2. On close inspection, we find that the familiar white plate below the keys from the older STRAFE design has been continued. This plate reflects the light emitting from the switches to offer brighter illumination compared to the other Corsair keyboards. A plastic plate is placed over the white plate only exposing the switch area while covering the rest of the keyboard. The chassis continues to be sturdy without any kind of flexing. 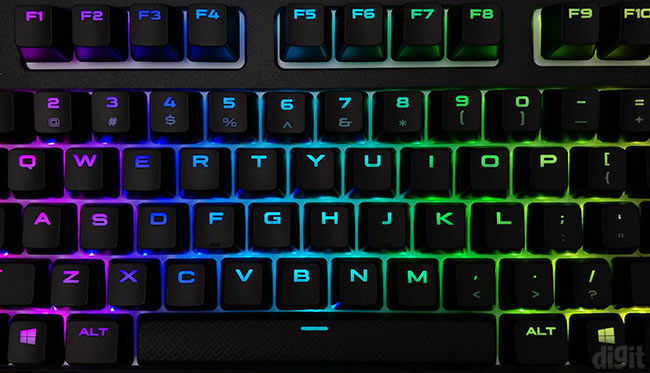 Corsair uses ABS plastic for their basic keycaps and the legends are laser-printed. These won’t be the most durable keycaps since, after a few years, the legends might start wearing off with heavy usage. However, the keycaps can be later swapped with Cherry MX compatible third-party keycaps. For better durability, you can opt for keycaps made from PBT as well. The extra keycaps are made of ABS plastic as well. To be able to distinguish them from the normal keycaps, a textured cover is installed on the top. 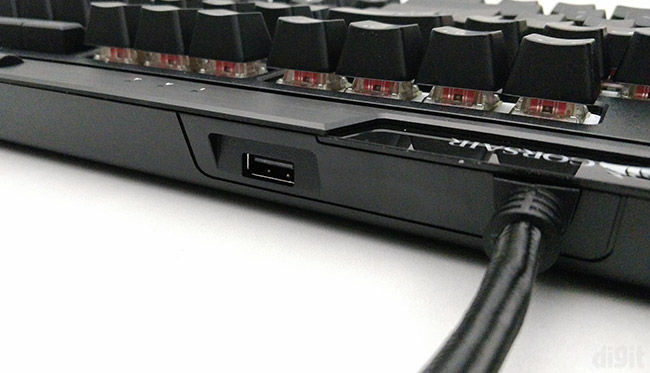 A USB passthrough port is present on the STRAFE RGB MK.2 on the top right edge beside the cable. Hence, there are two USB connectors, one for the passthrough port and the other for the keyboard. 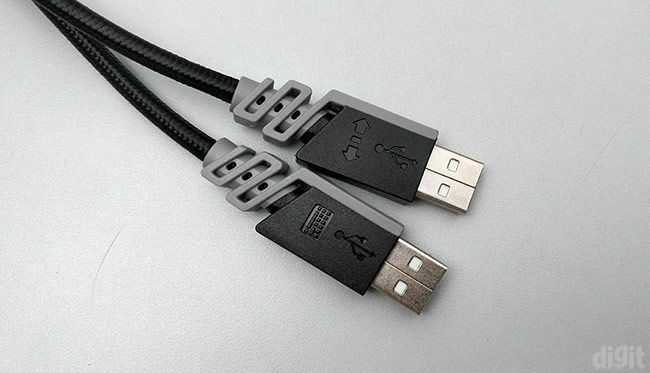 None of the connectors are gold-plated which could have given higher durability. We’ve been complaining how the older wrist rests on Corsair keyboards were flimsy and how they would rattle while typing. Although this problem has been taken care of on the K70 RGB MK.2, the same old wrist rest has been continued on the STRAFE RGB MK.2. The sturdier and heavier wrist rest on the K70 is much better. After verifying the key rollover, we check whether the keyboard displays any keyboard chatter out of the box. Chatter usually tends to happen after a few years on mechanical switches. They start registering multiple keystrokes on single key presses. No such defect was visible on the STRAFE RGB MK.2. The keyboard was tested on several game titles covering different genres. Since there’s full key rollover and no chatter at all, our gaming experience didn’t have any problem. Cherry’s MX Silent switch isn’t that common on keyboards. For gaming, people generally prefer linear switches with a low actuation force. The MX Silent does fulfil both these factors, but because of a slightly different design than the Red, it feels a little mushy. But when you’re gaming, quick taps are quite common. When you use the MX Silent, you might notice the subtle difference compared to a Cherry Red switch if you’ve used them before. The switches are still smooth but feel a little scratchier than the Reds. We would suggest experiencing the Silent switches before making a buying decision. 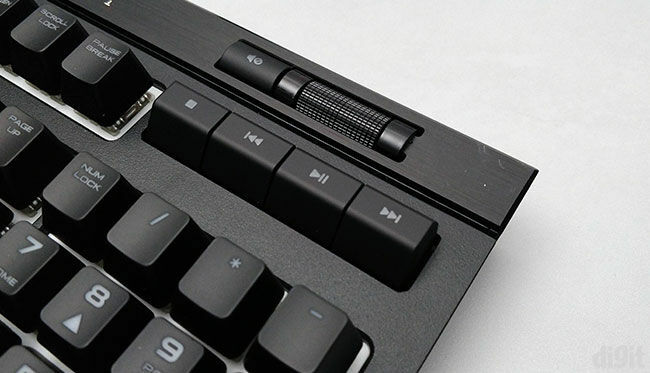 Although they might be favourable for gaming, linear mechanical switches aren’t really the most preferable while typing. 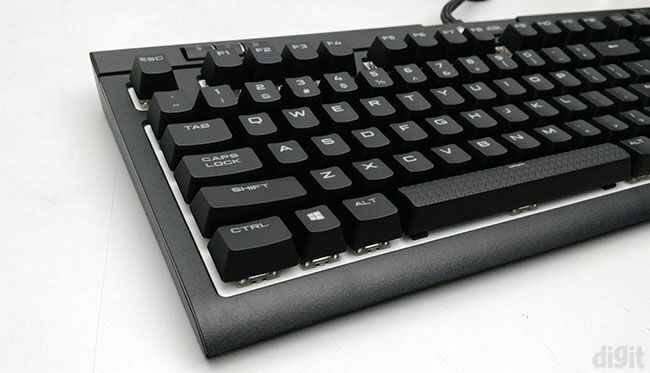 Tactile switches are best suited for typing where some users might even prefer clicky ones. However, this is more of a popular opinion rather than being universal. It still comes down to your personal preference. Coming to the STRAFE RGB MK.2, we didn’t enjoy typing on this keyboard initially since the switch felt scratchy. The scratchiness was so prominent that we could actually hear the stem scratching on the inside. 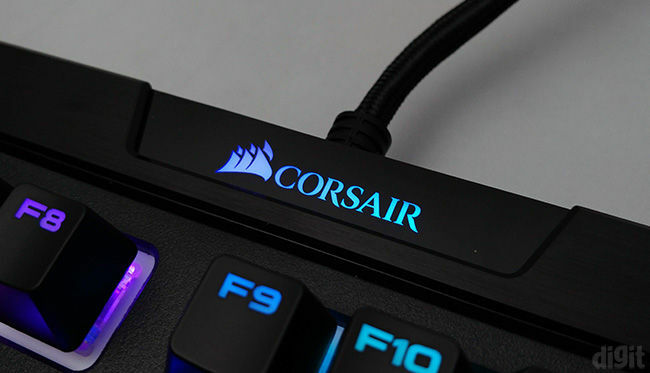 However, we found the same switches on the older Corsair STRAFE RGB to be much smoother. The older model could have become smoother over time. So, we will be keeping a close watch on the MK.2 to observe whether the same is replicated. Coming back to typing, the keys feel a little mushy the farther you press the keys. So, if you tend to bottom out while typing, then you might notice the cushioning at the end. This cushioning has been implemented to reduce the sound of the switches. For some users, this might not be the best experience. Summarising our experience with the keyboard, if silence is something you’re aiming for, the Silent will definitely do their job. However, we must remind you that the Silent switch will still create the traditional mechanical switch noise. The only difference here is that they aren’t as loud as the other switches. It’s definitely louder than a membrane keyboard.